They provide water, livestock forage, recreational opportunities, renewable energy and habitat for a wide variety of wildlife. It is one of the most dominate vegetation types in the western and north-western United States, although recently they’ve been undergoing major ecological and economic changes that have the potential to lessen the capacity in which these environments can perform their functions in the future. Therefore, adequate conservation and management of sagebrush ecosystems are one of the most difficult and crucial concerns in this part of the United States. As our climate changes and human land use changes along with it, sagebrush ecosystems have taken a toll. These effects are the main source of sagebrush decline and have been predicted to have more of an effect within the upcoming years; contributing to drought and worsened fire activity. The decreasing resources decrease wildlife activity and refuge. Human introduction of invasive species have caused increased fire frequency and intensity, while overgrazing and conversion of sagebrush to agricultural land reduced the overall area of sagebrush ecosystems. In response to the dramatic loss of sagebrush ecosystems, and consequently, habitat for wildlife species, land management agencies have attempted many large-scale restoration programs to restore sagebrush ecosystems to its original state and extent. It has recently been recognized that effective management and restoration of sagebrush ecosystems will benefit more from an approach that determines the best management practices in the most appropriate locations. Such priority areas for conservation are often determined by characteristics such as sagebrush cover, densities of endangered species and habitat threats such as fire history and invasive species. However, while potentially critical in the conservation of sagebrush ecosystems in the future, refugia in sagebrush ecosystems have not widely been addressed in management plans. Sagebrush ecosystems in the western and north-western United States may harbor three to four different types of refugia. These are fire refugia, drought/climate refugia, hydrologic refugia and refugia for invasive species, for this purpose however we will only go into fire refugia. In the sagebrush ecosystems of the United States, wildfire is one of the major ecological disturbances to plants and animals. Wildfires are a common and often a critical component of ecosystem functioning, where species distribution and behavior are largely influenced by a region’s fire regime. Wildfires reshape the landscape by providing new physical and biological properties and micro-climatic conditions for plant and associated animal species through release of nutrients, moisture and increased light availability. Some of the studies that have assessed the ecological impact of wildfire refugia on the survival and persistence of sagebrush ecosystems and their associated wildlife have found interesting results. From past research, it can be observed that one of the most essential characteristics of wildfire refugia is that they can continue to perform their key habitat functions, and consequently, enhance post-fire survival and recovery for wildlife species in their near vicinity. For example, regeneration of sagebrush after fire is enhanced in the surrounding area of fire refugia because of seed dispersal from unburned plants. Fire refugia in the form of undisturbed sagebrush offers cover for species that are predated on by birds of prey, such as pygmy rabbits, greater sage-grouse and sagebrush songbirds. This increases nesting success and loss of juveniles, which in the long term can have a stabilizing effect on populations of these species. In contrast to burned areas, fire refugia also continue to offer a direct food source for wildlife. Post-fire abundance of edible sagebrush, as well as many insects including ants, wasps, bees and beetles remains the same in fire refugia. 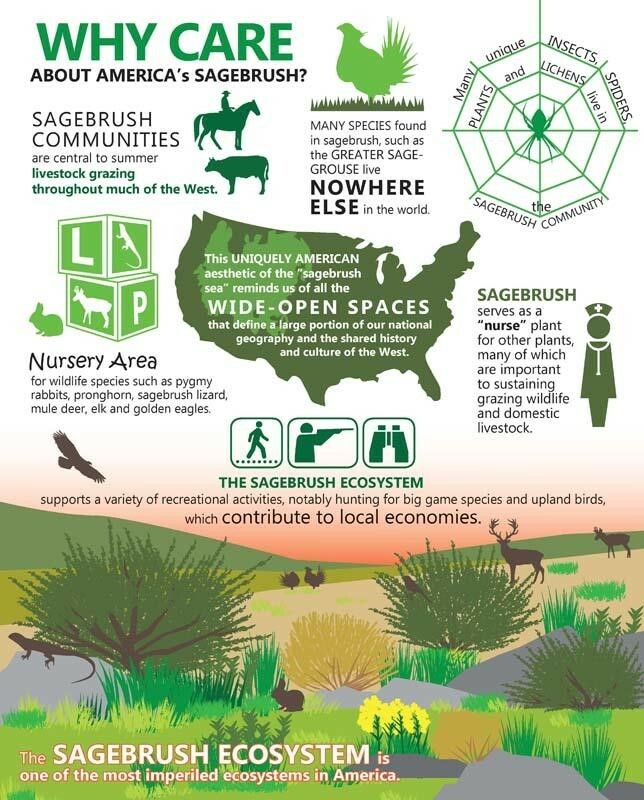 This is important, as both sagebrush and insects are an important food source for many sagebrush obligate species like greater sage-grouse, sagebrush songbirds, sagebrush voles, pygmy rabbits, pronghorns and reptiles like the sagebrush lizard. Lastly, even if unburned islands cannot support breeding populations of wildlife species, they may still provide essential temporary habitat for maintaining a population of a certain animal species and allow for safer dispersion of animals after fire. This information shows that fire refugia embedded inside of a fire perimeter have high ecological value and potential for conservation and recovery of sagebrush ecosystems, and should be preserved wherever possible after disturbances like fire.